In recent years the UK has experienced an influx of unaccompanied asylum-seeking children (UASC). Home office statistics indicate that in 2016, 3290 unaccompanied children applied for asylum in the UK; all of these children require an initial health assessment (IHA) after arrival in the UK. This population of children have very different health and social care needs to other looked-after children (LAC): in 2015 the largest proportion of asylum seekers originated from Eritrea, Syria, Pakistan, Iran, and Sudan – countries with high prevalence of blood borne viruses (BBV) and tuberculosis (TB) – and had travelled through many countries with widely differing health needs prior to arrival in the UK. Additionally, the higher rates of sexual violence, torture, and physical and mental health problems in this population contribute to growing evidence that their health assessments require a tailored approach. The IHAs are performed in LAC clinics across the UK, and legal guidelines state that they should be completed within 28 days of being placed in state care. In East London there is no standardised pathway or guidance, and this project aims to assess the need for a tailored local guideline to ensure the health and social care needs of this vulnerable population are not being overlooked. In 100% of cases the patient is seen with an interpreter (RCPCH Child Protection companion 14.3.1). In 100% of cases the legal status of the child is documented (RCPCH Child Protection companion 14.3.1). In 100% of patients a list of countries travelled through is documented (UASC Health: Clinical guidance for primary care and GPs on the health needs of UASC). In 100% of patients risk of exposure to TB is assessed (NICE Clinical Guideline NG33). 100% of new entrants to the UK who are from countries with a high incidence of TB is offered screening for latent TB (NICE Clinical Guideline NG33). In 100% of patients from a country with HIV prevalence over 1% or at increased risk of HIV, screening is recommended (Public health England: Migrant health guide). In 100% of patients from a country of medium or high prevalence of hepatitis B or C, screening is recommended (NICE Public health guideline PH43). 100% of patients are assessed for a risk of haemoglobin disorders and screening recommended if appropriate (Public health England: Migrant health guide). In 100% of cases the child is screened for having been a victim of torture and referral to organisations is offered (RCPCH Child Protection companion 14.3.1). In 100% of cases contact with birth family is asked about and advice offered (UASC Health: Clinical guidance for primary care and GPs on the health needs of UASC). In 100% of cases mental wellbeing is assessed and support offered if indicated (UASC Health: Clinical guidance for primary care and GPs on the health needs of UASC). In 100% of cases a full immunisation history is taken (RCPCH Child Protection companion 14.3.1). In 100% of cases children with an unknown or incomplete vaccination schedule are recommended to have a catch-up schedule (Public Health England; Vaccination of individuals with uncertain or incomplete immunisation status). 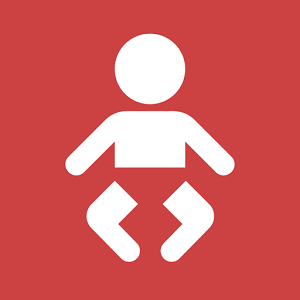 In 100% of cases a recommendation is made for child to have FBC to screen for eosinophilia and anaemia (Public health England: Migrant health guide). In 100% of patients symptoms of PTSD are screened for (UASC Health: Clinical guidance for primary care and GPs on the health needs of UASC). In 100% of cases a history of being trafficked is screened for and advice offered (Department for Education: Care of the unaccompanied and trafficked children). In 100% of patients the risk of Female Genital Mutilation (FGM) is assessed (RCPCH Child Protection companion 14.3.3). 100% of patients with a history of FGM are referred to a specialist (RCPCH Child Protection companion 14.3.3 ). Progress made: What have you learned from doing this? We have completed the initial audit and presented the findings in the local audit meeting. The demographic details of the patients in this study are representative of national statistics, with the majority being from Eritrea or Sudan. Most of the countries listed do not routinely speak English as their first language, and it is encouraging that the majority (80%) were seen with an interpreter. 73% had the countries they visited on their journey documented. Only 73% had a risk assessment for BBV, and 60% of patients had a recommendation for BBV screening sent to their GPs; 33% had their risk of TB documented, and all of these had a recommendation made to their GPs for TB screening. 13% of patients had a recommendation sent to their GP for a full blood count. All the UASCs audited came through countries with a high prevalence of BBV and TB, and are at high risk of sexual violence on their route here, necessitating a blanket approach to screening. All patients had their immunisation status checked with a recommendation to the GP to complete catch-up vaccinations. Of the two girls included in our patient population, one was asked about FGM and had a positive history. She was referred appropriately. Both were from countries where FGM is practiced. From a mental health, social and safeguarding perspective, the numbers asked about whether they had contact with their family, were trafficked, or had experiences of torture were poor (47%, 13%, 20% respectively). However, all children were asked about their mental health in general. What’s your take home message? In conclusion, the current IHA for UASC in Tower Hamlets meets some of the national standards for this population, however many specific needs remain unmet. 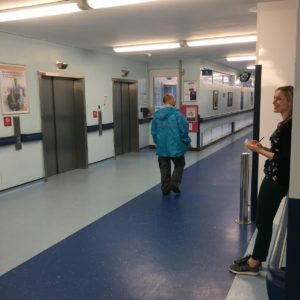 We feel that the current proforma, documentation methods and lack of guidelines in Tower Hamlets are contributing to the substandard quality of care. To develop guideline and an integrated health pathway aiming to support LAC clinicians in making the appropriate referrals and signposting the patient and social worker to other services. Institution of a tailored proforma for IHA medicals in UASC aiming to aid the clinician in asking the relevant questions and referring to appropriate services. To improve awareness amongst clinicians completing IHAs at Tower Hamlets of the specific health and social care needs of UASC. To re-audit IHAs in UASC after completing the above steps. To gain feedback from service users to inform and improve our service and pathway. To use this data to advocate for changes in health policy which protect and safeguard this vulnerable population. To contribute data to a London wide project assessing IHAs in different boroughs with the aim of standardising and streamlining care. Home Office. National Statistic, Asylum. Asylum – GOV.uk. [Online] 27 August 2017. [Cited: 10 Jan 2018.] https://www.gov.uk/government/publications/immigration-statistics-april-to-june-2015/asylum#key-facts. Refugee Council. Asylum Statistic Annual Trends. London : Refugee Counci Informationl, 2018. UASC Health. Clinical guideline for primary care and GPs on the health needs of UASC. UASC Health. [Online] 2017. [Cited: 03 October 2017.] http://www.uaschealth.org/resources/paediatrics/#1490284388881-f29da208-8e9d. —. Clinical Guidance for Primary Care and GPs on the Health Needs of UASC. Kent : UASC Health. Department for Health. Statutory Guidance on Promoting the Health and wellbeing of Looked After Children. London : Department for Health, 2009. UASC Health. INITIAL HEALTH ASSESSMENT SUMMARY REPORT. Kent : UASC Health. Developing an integrated health pathway for unaccompanied minors in London. O’Donnell, Najette Ayadi. The Hague : IPSCAN European Regional Meeting, 2017. Home Office. Immigration Rules part 11: asylum. London : Home Office, 2016. Royal College of Paediatrics and Child Health . 14.3.1 Children from minority groups. Royal College of Paediatrics and Child Health. [Online] 03 October 2017. [Cited: 03 October 2017.] https://www.rcpch.ac.uk/child-protection-companion/143-children-minority-groups. NICE. TUBERCULOSIS NICE Clinical Guideline NG33. London : National Institute for Clinical Excellence, 2016. Public Health England . HIV: migrant health guide. GOV.UK. [Online] 31 July 2014. [Cited: 03 October 2017.] https://www.gov.uk/guidance/hiv-migrant-health-guide. National Institute for Health and Care Excellence . Hepatitis B and C testing: people at risk of infection. National Institute for Health and Care Excellence . [Online] December 2012. [Cited: 03 October 2017.] https://www.nice.org.uk/guidance/ph43/chapter/1-Recommendations#recommendation-4-testing-for-hepatitis-b-and-c-in-primary-care. Public Health England. 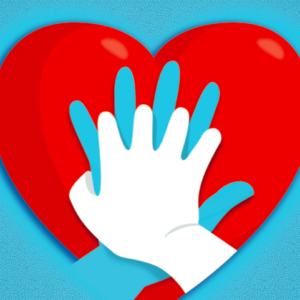 Haemoglobin disorders: migrant health guide. GOV.UK. [Online] 31 July 2014. [Cited: 03 October 2017.] https://www.gov.uk/guidance/haemoglobin-disorders-migrant-health-guide. Public Health England . Vaccination of individuals with uncertain or incomplete immunisation status. s.l. : Public Health England, 2016. Department for Education. Care of Unaccompanied and Trafficked Children . s.l. : Department for Education, 2014. Royal College of Paediatrics and Child Health . 14.3.3 Children from minority groups; Female Genital Mutilation (FGM). Royal College of Paediatrics and Child Health . [Online] 03 October 2017. [Cited: 03 October 2017.] https://www.rcpch.ac.uk/child-protection-companion/1433-children-minority-groups#514. National Institute for Clincal Excellence. NG33: Tuberculosis. National Institute for Health and Care Excellence. [Online] May 2016. [Cited: 03 October 2017.] https://www.nice.org.uk/guidance/ng33. Public Health England. Helminth infections: migrant health guide. GOV.UK. [Online] 31 July 2014. [Cited: 03 October 2017.] https://www.gov.uk/guidance/helminth-infections-migrant-health-guide. ISSOP position statement on migrant child health. International Society for Social Pediatrics and Child Health. 1-10, Geneva : Wiley, 2017, Vol. Child Care Health Development . A smartphone app to help with common calculations, concise reference information and easy-to-follow checklists for common emergency situations. I am passionate about getting people moving, recognising that small, sustainable changes to our day to day life are an important aspect of tackling the current obesity crisis. Encouraging people to use stairs rather than lifts with posters is one such evidence-based intervention. A website designed to bring the concept of FOAM, Free Open Access Medical Education to paediatrics. interesting and high quality educational resources presented in an engaging manner. 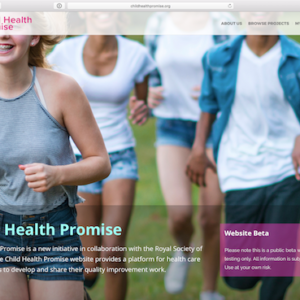 Child Health Promise is a website where quality improvement projects are shared and professionals collaborate to replicate and improve good ideas.